With still one day to go for the 30X30 Dubai Fitness Challenge (DFC) to end, the city has already crossed its target of attracting one million participants in the initiative, Ahmed Al Khaja, CEO of Dubai Festivals and Retail Establishment (DFRE), confirmed to Khaleej Times on Friday, the second last day of the closing carnival of the DFC. Last year’s total engagement numbers at the challenge saw 786,000 citizens and residents commit to 30 minutes of daily physical activity for 30 days, and this year, the DFC had set a goal to get more than one million people on board. “It couldn’t have been better as the city has surpassed our expectations. We still have one day to go and we have already achieved our target of seeing participation of over one million people. We want everyone to come and join the celebration of this great event and be part of this movement of making Dubai the most active city in the world. It has been a combined effort of all entities in the emirate – government and private. It was the philosophy and concept of Sheikh Hamdan bin Mohammed bin Rashid Al Maktoum, Crown Prince of Dubai and Chairman of the Dubai Executive Council, that once we get people to accept the 30X30 challenge, it will become habit that they will then continue. We hope the city keeps up this spirit of participation,” Ahmed Al Khaja said. 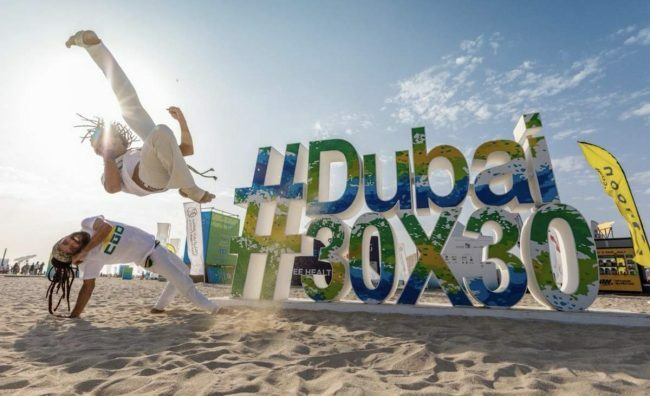 Friday also saw some dedicated fitness buffs even ditch the three-day super sale and participate in the closing weekend carnival of the Dubai Fitness Challenge at the Burj Park in Downtown Dubai between 2pm and 10pm. People came with friends and family for the dazzling closing carnival that promised an adrenaline-pumping action. The carnival will continue on Saturday from 1pm to 8pm. Thousands celebrated their almost month-long hard work at the closing carnival that featured the best of what the fitness movement had to offer. Catering all age groups and fitness abilities, the carnival hosted a range of activities, fitness classes, competitions and performances. Ajman resident Seeja and her family were fascinated as they made their way on to the premises of the DFC for the very first time. “We came to witness the closing of the DFC as we have been following it even while staying in Ajman. I am here with my two kids who are absolutely awestruck with the level of motivation and fun this challenge is offering to the participants. My 16-year-old daughter has an exam tomorrow but she decided not to miss the last two days of the DFC since we couldn’t attend the activities throughout the month. I am amazed at the concept and the interesting ways the DFC has used to get people into fitness and this is one way of getting people off gadgets and let them focus on their health,” Seeja said. From toddler gyms, 30X30 with Disney characters, VR zones, sports arenas including cricket and football zones to kick boxing, Zumba, obstacle race, boot camps and physiotherapy and massage zones, the carnival saw the best coaches and instructors holding free sessions for the public.